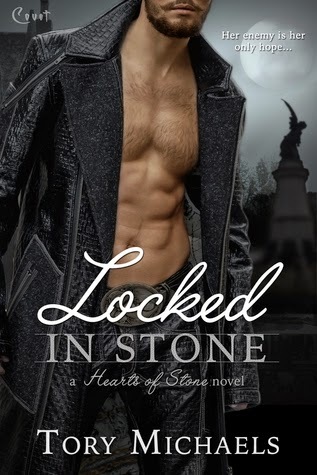 I like to call myself the Covet imprint's biggest fan and LOCKED IN STONE—in spite of my rating—is a good example of why. Paranormal romances might be waning in popularity with the band-wagoners who came on when a certain books-to-movies thing happened but die-hard lovers of the genre like me are always ready for something fresh and cool. LIS brings a really neat gargoyles and angels and demons world building set into the genre but I'll admit I felt like the category romance format quashed it a bit. I definitely wanted more out of it than I got. While I liked the concept and generally most of the book, the romance itself was really unenjoyable. It's billed as an enemies-to-lovers kind of romance but I never really felt like Rose and Cal were enemies, more like they made shaky excuses constantly why they weren't allowed to be together or why she was angry with him. I also found the idea that he was an adult protector of her mother back when she was a little kid kind of squicked me out in terms of them having a relationship. With most paranormal stuff I can get past a certain amount of age difference but there's just something about this particular set-up that made it not work for me. I had to skim the love scenes because they made me uncomfortable. Now, my quibbles aside, I think it's a pretty interesting concept that really deserved more fleshing out. There were certainly areas I think would have added to the overall story that might not have directly influenced the romance but would have made the series arc more ready for continuation. I really enjoyed the secondary characters, Tom in particular, and hope they'll play into the next pair of stories well. Overall, I think LIS would be a good place for a paranormal romance newbie who hasn't gone beyond vampires and werewolves to get started. I had my issues with it but I feel like they're in many ways the result of being PNR reader for more than a decade. I'm a junkie for their Brazen and Bliss lines. I haven't read any of this line I don't think. Even with issues it sounds like a great start to the series. Love that there are gargoyles!